Lares Trek is one of the best options to hike to Machu Picchu! 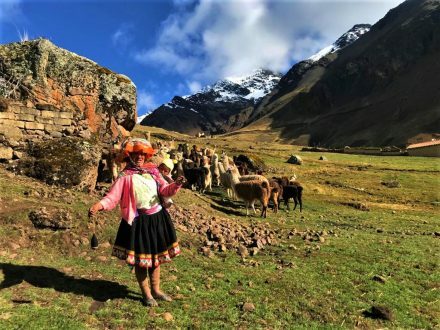 The 4-day-trek gives you great opportunities to get an authentic insight of local people’s daily life and culture, to see alpaca and llamas shepherds, and to enjoy great landscapes like the amazing mountains and beautiful Sacred Valley of the Incas and Lares Valley. You will enjoy a bath in the natural hot springs of Lares, and be amazed by the color of the natural lagoons formed by the melting of the ice pick of the Andean Cordillera. 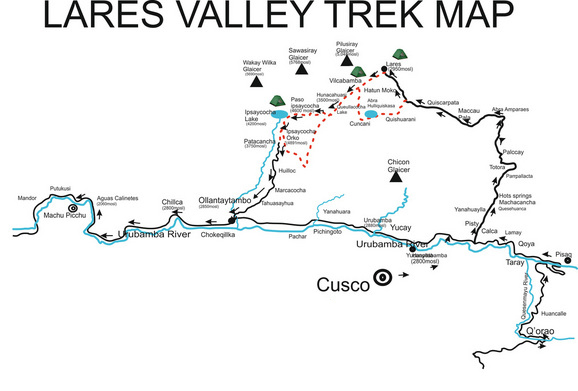 -> Check out the Video of our Lares Valley Trek!! Your adventure trip begins at 4:00 am in Cusco, where we pick you up from you hotel and then start our way through the Sacred Valley of the Incas. We pass the colourful town Calca and then ride up to the left side of the valley on a beautiful winded road, crossed by crystal clear rivers and waterfalls up to the Lares Pass and into the Lares Valley. Reaching our first destination, the Lares Hot Springs, you will be able to dip yourself in these natural baths with temperatures up to 45C. That will definitely refresh your morning! During this time, the crew will prepare you a nutritional breakfast which you will consume after the bath. Around 9:30 am we start our hike, taking the path in direction to Huarcahuasi town. The hike will take around 3 hours and passes a beautiful small valley with a special flora,that changes according to the ascent until the highest part of the Lares Valley. On the way you will discover many domestic animals as well as llamas, alpacas and sheep, surrounded by farming areas with local crops. We will reach Huarcahuasi town around noon and have a short rest before our lunch. This town shows a great mixture of traditional and modern constructions, while people still keep their traditional way of clothing and their costumes. We will have lunch around 1:00 pm and afterwards start exploring the area around with your tour guide. For example, you will visit a crystal clear waterfall that is located in the end of the town. In the afternoon you will experience the return of the llama herds to their shelters in the local farms. You will return to the camping side around 6:00 pm to have tea time before dinner. We will spend the night on the camping side in the backyard of a local families’ house. We will share dinner with them and hear some histories about Andean traditions and legends. Distance Travelled: approx. 10 km. We wake up very early on our second day to have a delicious breakfast, and then prepare ourselves for an amazing hiking day where we will reach the highest point of the trek (higher than the “Death Woman Pass” on the Classic Inca Trail to Machu Picchu). We first follow the slow ascending path of Huarcahuasi town. From the upper part of the town, you will be able to enjoy the view over the snow peak that shapes the Lares Valley. Further on hiking, you will pass by a small blue lagoon, coloured by the minerals of the Andes, where you will have some local people selling you water or even beer in the middle of nowhere. That might sound weird, but it’s really fun to see local people with their beautiful clothing and in their natural environment. After a few hours of hike, we will reach the highest pass (Ipsay Pass) at 4500 meters altitude. 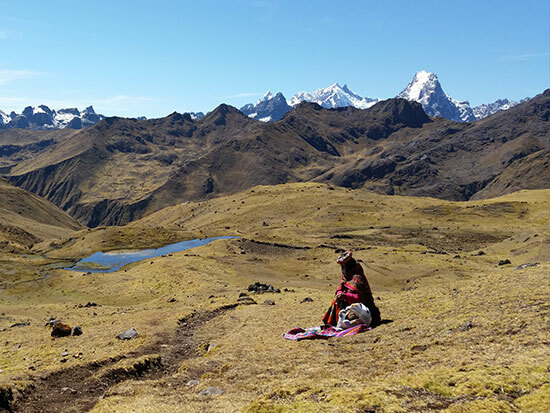 From here you will enjoy the last view over the Lares Valley and the surrounding mountains, descending to the Ipsaycocha Lagoon where the crew will be waiting for us with lunch. You will have some free time to enjoy a short walk around the lagoon to observe the Andean water birds, and sometimes even Pink Andean Flamingos. Later on, you will take the path downhill for around 3 hours to the town Patacancha, having an amazing view over the Valley of Patacancha and its river of the same name while continuing our hike. We will arrive to the camping side in the end of the day, where our crew will be welcoming us with hot drinks and a delicious Peruvian dinner. Enjoy the night under the milky way – an experience that you might only live once! 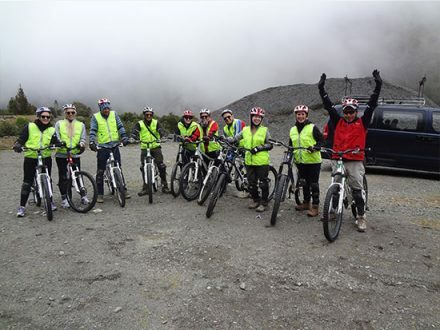 Maximum Altitude: 4500 m./13134 ft.
We will begin our third day with a great breakfast and afterwards enter the vehicle that will transfer us from Patacancha to the Pumamarca archaeological site. This site is one of first known Inca settlements. 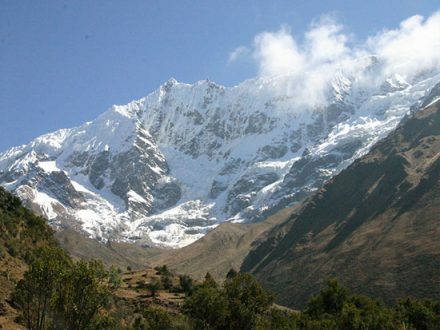 We will have a quick lunch after visiting the site of Pumamarca, and then hike to the Sacred Valley of the Incas. The path we take is part of the Original Inca Trail that once connected Ollantaytambo and Pumamarca. During this short hike, we will have the great opportunity to observe one of the first Inca terraces at one side of the Patacancha Valley. In the end of this path we will take the transport to Ollantaytambo (the last living Inca town) from where we will take our train to Aguas Calientes at 04:36 pm. In Aguas Calientes, you will be picked up from the train station and brought to your hotel. Having a rest at your hotel room, make sure to recharge your camera and other devices in order to enjoy Machu Picchu at its fullest the next day! In the later afternoon, you will have some free time to explore Aguas Calientes and enjoy a dip in the local hot springs (not included). You will take your breakfast very early in the morning. Then we start our last day, climbing up the hill to the famous Inca citadel Machu Picchu, the lost city of the Incas. Avoiding the crowds, you will be one of the first visitors of the day. Your tour guide will take you around the vast ruins for about 3 hours, comprehensively explaining its historical significance and place in the Inca Empire. After this you have some free time to wander around. Machu Picchu is the best known of all the archaeological Incas sites, as it is recognized worldwide! 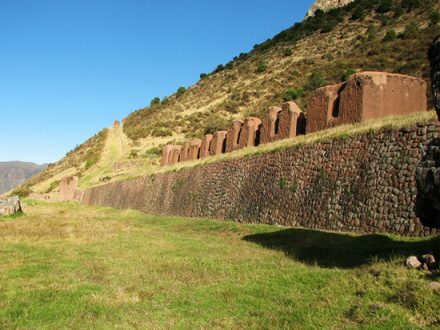 Experts believe that the citadel was constructed around the mid-15th century by the Inca Pachacuteq and was then rediscovered by American historian Hiram Bingham in 1911. The guided tour of this fascinating place will be an unforgettable experience! You will visit the Main Square, the Royal Quarters, the Temple of the Three Windows, the Circular Towers, the Sacred Sun Dial and the Burial Grounds. After the guided tour, you are free to hike up Huayna Picchu (the mountain behind Machu Picchu), where you will enjoy stunning views over the whole complex! However, there are only 400 entrance tickets available every day; therefore you must let us know in advance if you want to do the hike so we can reserve your ticket at an extra cost of US$ 15.00. Due Huayna Picchu is very fast oversold, we offer Machu Picchu Mountain as a second optional climbing. The advantage of this hike is that it will be less crowed, but not less beautiful! The cost for this hike is also US$ 15.00 per person. Having one of these two additional entrance tickets to hike one of the mountains, you can afterwards go on an unguided walk to Inti Punku, the SUN GATE, which is the traditional end of the Inca Trail (hike of 3 hours) or you can visit the beautiful Inca Bridge (hike of 1 hour). Otherwise you can simply relax and take in the awe inspiring atmosphere, as well as take many breath taking pictures. After the time in the sanctuary, we take one of the frequent buses back down to Aguas Calientes for a late lunch. In case you don’t want to take the bus, feel free to walk down through the beautiful jungle which will take you 45 minutes. In the late afternoon at 7:00 pm, you take the train back to Ollantaytambo and from there the tourist transport to Cusco. If you want to return to Cusco in the early afternoon, please let us know so we can book an early train at 2:30 pm or 4:12 pm. The early train has a cost of +US$ 30. Times cited in this itinerary are aproximate. Walking times depend on the group! The guide can change lunch and camping spots depending on the group’s progress. correspond exactly to the described route. An extra night in Aguas Calientes can easily be arranged if you let us know in advance, so we can change the date of your train ticket for the following day. 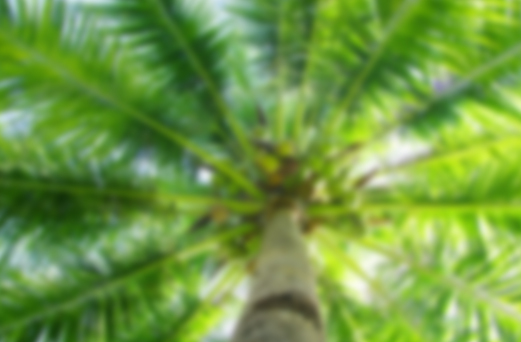 According to your request, the cost of the hotel can depend. Meals (4 breakfasts, 3 lunches, 3 dinner, daily morning snack, daily tea service except last day). Group price US$ 550.00 based on 4 people. Price for 2 people US$ 660 per person. Price for 3 people US$ 600 per person.